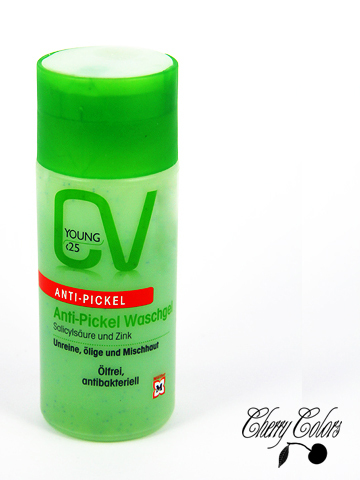 Review: Cadeavera Young Anti-Pickel Waschgel - Cherry Colors - Cosmetics Heaven! It's been a while since my last review, so I decided to review a thing I had at home for months! It's a cheap wash gel, from Cadeavera (Müller). It comes packed in a quite pretty (renovated) package. The ingredients are so-so, but I honestly didn't expect much from it anyway. I bought it by mistake since I already have another cleansing gel. I thought it was the toner (since someone put it there by mistake). But anyway, now that I have it, I should use it. I don't like wasting stuff anyway. The opening is quite big enough, but sadly the package itself is a bit sturdy so when you reach the bottom half, you have to squeeze it hard! And shake it a bit, so you get a bit of gel out. And even then too much of it gets out! You can see that it's not a clear gel. It has blue dots that should serve as a peeling in a green based gel. I don't like colored gels (too many useless ingredients! ), so well I wasn't too happy when I found out that it's not the package that it's colored but it's the gel itself! It also doesn't work well as a peeling. The gel is scented, and I can't really describe the scent. All I can say is that it smells like perfume. Artificial. It also spreads easily, kind of oily maybe? It almost doesn't lather up, which makes the cleaning a bit harder, but still manageable. I have combination skin, and it's usually quite hard to find a cleansing gel that doesn't leave my skin or oily or dried out. Well, this one leaves it dried out a bit. So I have to follow up with toner and cream almost immediately! +Is great for brushes cleaning. -Dries out my combination skin. -It's hard to get out the gel after the bottle is 1/2 full. -Has way too many colors in it. Overall: If I would be searching for a new cleansing gel, I wouldn't buy it again. I really don't like it that much because it dries my skin way too much. It's also way too colored and scented. Not nice for sensitive skin (I guess). But when it comes to the price, I think there should be greater products for the same price (I must try some of Terra Naturi's gels). Even Alverde has some great and cheap gels... So in the same price range, you can get way better stuff. But thumbs up, for the new Cadeavera line!